Requires ASP on your hosting. Dreamweaver ASP Appointment Calendar is an extension for Adobe Dreamweaver which allows you to book, show and edit appointments as well as create event calendars which show different activities throughout the day. For each day in the calendar you will be able to define which are the timeframes for appointments or activities, add information in the hours already booked or leave them free to allow a reservation later. Examples of cases where this product can be recommended: booking/management of meetings / appointments for lawyers firms, doctors, veterinaries, beauticians, etc, as well as to show different activities during an event, a scholar calendar (ex, class planning), tourist group daily planner, and for virtually any kind of activity which is developed with specific schedule during the day. This calendar is highly flexible, you can create periodical schedules (i.e., events each 20 minutes, or every hour), as well as changing schedules. You can define which days are open for business (ex, Monday to Friday), and also the exception days with no activities (holidays, planned interruptions, leaves.) For each booked schedule you can write a title and comments for reference. You can choose to show a monthly view of the calendar, or show several months simultaneously. Note*: This product is for servers with ASP scripts support. We have the same product for servers with PHP support here: PHP Appointment Calendar. Note**: This product uses plain text databases. If you are looking for a product based on MSAccess databases then check the ASP Appointment Calendar with Database. *Quick note: The demos on this page and visual tutorial here are PHP based because we have a similar extension for PHP server, however note that this ASP Appointment Calendar only requires ASP as server side script. It's necessary to set writing permissions to the folder "TDE_ASPAppCalendar/admin/database" where the data will be saved to. You can consult our FAQ if you are not sure how to proceed. If you want to use it as a Dreamweaver extension: Adobe Dreamweaver: Dreamweaver MX or any later version, including MX 2004, DW 8, CS3, CS4, CS5, CS6, CC. Please read below the "Basic Installation" and "Development Notes". For visual information, please consult the animated video-demo. Additional Info: ASP Appointment Calendar - Online FAQ. Double click on the downloaded .MXP file. This will install the product in Dreamweaver. At this time you will have access to a new option in your Dreamweaver, which can be found under "Dreamweaver Menu >> Commands >> Insert ASP Appointment Calendar"
Open the page where you wish to install your calendar. This page must be previously saved within your website. 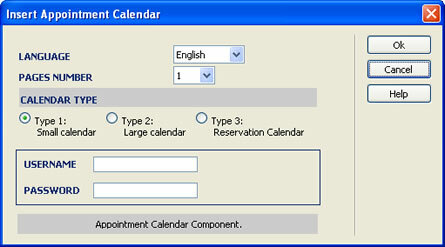 Calendar Type: Select what type of calendar you require; it can be "Type 1 - Small Calendar", "Type 2 - Large Calendar", or "Type 3 - Reservation Calendar", as explained previously. Page count: amount of months that you wish to show simultaneously in your calendar. Language: Calendar language. At this time, the following languages are available: English, Spanish, French, Italian, German, Japanese, Portuguese and Dutch. User: Name of the user who will access the calendar's admin. Password: Password to access the calendar's admin. When you click on OK, the calendar will be inserted in your page, and all the relative files pertaining to the calendar's admin will be automatically created. Set writing permissions to the folder "TDE_ASPAppCalendar/admin/database" where the data will be saved to. You can consult our FAQ if you are not sure how to proceed. Keep in mind that you have to set writing permission for the folder "TDE_ASPAppCalendar/admin/database" and to the files inside it. To know more details about how to set writing permission please read this entry in our FAQ. These days will be shown in the calendar as stricken through. To delete times, mark them and use the button "Delete marked times"
As you can see, all the work is realized on a single page, which is highly interactive, done in real time with comfortable effects based on modern dynamic scripts.